Picasso - amongst all the other interesting things he said - remarked that, "Painting is just another way of keeping a diary." He was so right. I have kept many drawing books, usually small so that they can be slipped into a bag as I travel, and I was going through some of them recently. As I leafed through the pages, memories came flooding back. No matter how quickly I did a drawing or painting, it still has the power to evoke. The place, of course, but the sounds, the scents, the other events surrounding my doing the art - all are connected to the art-making. I am not sure that had I only kept a written diary, I would have such vivid memories of all those trips I have made. Yes, I do keep a written journal, but I tend to record other types of things, such as names, people, events. I think that art-making is always a record of where the artist is in terms of life and experience. Viewers may not always understand the art from the "diary" point of view, but the artist can always remember. Historically, there have been some wonderful diaries left by artists. Two very famous ones are from Renaissance times. Albrecht Durer's 1521 diary of his trip to the Netherlands was a series of astonishing silverpoint drawings of places, people, sights that he experienced. He had kept other diaries before this one, but executing the drawings in unforgiving silverpoint is stellar work. Paper was still a precious commodity so Dürer used the pages on both sides and crammed things into them. The image reproduced was apparently done when Dürer visited Brussels and went to the Coudenberg Place zoological gardens. He also drew lions there and was generally fascinated by the animals. He went to this zoo in 1520 on his way to the Netherlands, and then did these drawings when he returned in 1521, on his way home. Another very famous diary-keeper was Leonardo da Vinci. 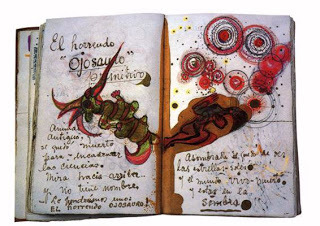 He kept notebooks in which he drew out ideas, made notes and calculations, basically evolving as an artist. 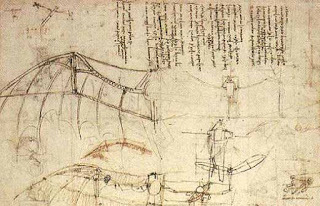 This image is courtesy of the Victoria and Albert Museum, one of Leonardo's small, intense diaries, full of genius calculations, thoughts and observations. This is a page from the Codice Atlantico, a wonderful collection of pages of Leonardo's thoughts and observations, with 1750 drawings on 1119 pages, dating from 1478 to 1518. The Codice belongs to the Ambrosiana Library in Milan and constitutes one of the most amazing diaries an artist has ever kept. 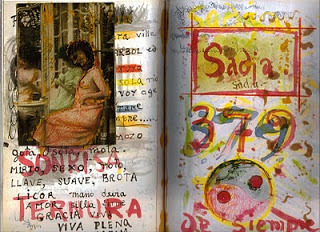 Another artist, much nearer our times, who famously kept a diary was Frida Kahlo. In effect, most of the art she produced was about herself, a form of journaling. Nonetheless she formally kept a dairy too about her Mexican world. These are pages from her journals. They are eloquent testimony to her spirit and creativity. Today's artists don't just confiine themselves to diary-keeping on paper - video and photography are other means to record life. Nonetheless, a small spiral or moleskin journal slips easily into a pocket and goes everywhere with you as you navigate life as an artist. Try following Picasso's advice!